Father Joe’s Villages and Connections Housing Downtown will accommodate nearly 150 additional homeless residents Tuesday evening due to frigid overnight temperatures, according to the San Diego Housing Commission. The commission activates the Inclement Weather Shelter Program when temperatures drop below 50 degrees, the chance of rain is higher than 40 percent or sustained high winds are predicted. The program is funded through a partnership between the commission, the city of San Diego, Father Joe’s and Connections Housing. 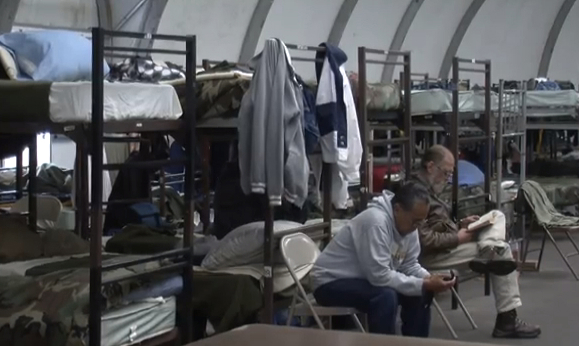 Father Joe’s can shelter an additional 113 residents throughout the night while Connections Housing can add up to 30 residents. Check-in at Father Joe’s begins at 4 p.m. and residents are expected to check out by 5 the next morning. Check-in at Connections Housing runs from 5:30 p.m. to 7 p.m. and residents are expected to check out by 7 the next morning. Those at both shelters will have meals provided to them. Residents can dial 211 or visit 211sandiego.org to find out more about the county’s Inclement Weather Shelter Program.